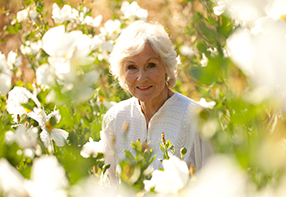 Molly Chappellet is an artist, lover of plants, author, and photographer, as well as the co-founder of world-renowned Chappellet Winery. Inspired by her agricultural surroundings and the natural habitat of Pritchard Hill, Molly creates panoramic land art from discarded vineyard materials. Heaps of tangled wire, old grape stakes, rusted irrigation pipes, and used straw “waddles” form dramatic sculptures in the middle of the Vineyard Garden. Surrounding her home, massive limbs from a 350-year-old oak accompany enormous boulders within swaths of native and exotic plantings providing a harmonious and healing environment.